Trying to Update Windows 7/8 or Windows 10 is never easy as it seems. There are several Errors that might pop up while in the Process. The Errors may just seem like a random code but these Codes don’t allow you to Update your Copy of Windows. One Such Error code is 0x80080008 which we are going to Discuss today. 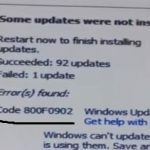 So 0x80080008 is the error code that is shown to you every time you try to install updates using Windows update feature. We are here to help. We are here to make you understand what is error code 0x80080008 and how to fix it. So lets get started. There are More then 5 methods to fix this issue. We gathered them all with our research but some of them are already not helpful to users. 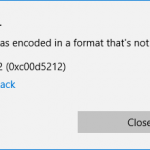 So we have Come up with 2 Ways to fix error 0x80080008 in Windows 7/8 or Win 10. We are Confident about our Methods that we are going to share. We know that you will be benefited and should fix this error if you perform the steps correctly. Note: This Method may harm your PC if not done Correctly. So recommend you to Backup your Registry before performing below Steps. Microsoft has an article on How to backup Registry in Windows. This Method Involves making changes to Registry entries. This step is not always Recommended but the it seems to be working for users having this particular error code. So here is what you need to do. Step 2: Copy and Paste following lines in it. Step 3: Now Save the file as “Reg.bat” , You can name the file anything but remember there should be “.bat” extension after it. Step 4: Right Click on the File and Run it as Administrator. Provide Permission if asked. Step 5: Reboot Your PC when everything is done. Step 6: After Rebooting your PC, Simply go to Windows update and try to install them. This time you should not see error code 0x80080008 on the screen. Method 2: Repairing Windows Image. For this method you will need a Command Prompt with Administrator Privileges and we will be using Development Image Servicing and Management (DISM) Command line tool. The Procedure is simple and will not take too much time. So lets jump into it. Once you have done things mentioned above, its time to try and Download Pending Updates which was throwing code 0x80080008. In Most Cases this should fix the issue for you and now you can do the update smoothly. If Both the methods mentioned above do not make any changes to your situation then, Kindly Post below in comments. Let us know what you tried. 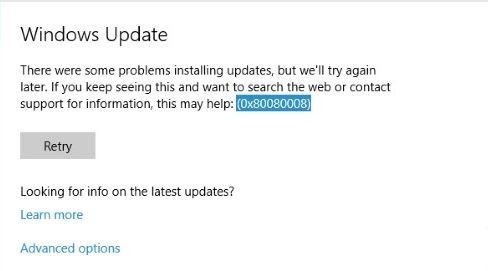 Also let us know if any of the above method helps you to fix Error Code 0x80080008 while updating windows. Your Feedback will Encourage us even more. We will update this post with More ways to get rid of the error in future.